The Lenovo Yoga 520 – 14IKBR-742 is a new 14-inch ultrabook convertible into a robust (aluminum shell) and stylish tablet. Intended for an office audience , it consists of a solid base with a Core i5 Kaby Lake Refresh, 8 GB of RAM and a 256 GB dedicated SSD, complemented by a rotating HD touch screen anti-reflective treatment. Also plan small amenities such as a fingerprint reader, USB Type-C and a proper battery life, all for less than 800 euros . 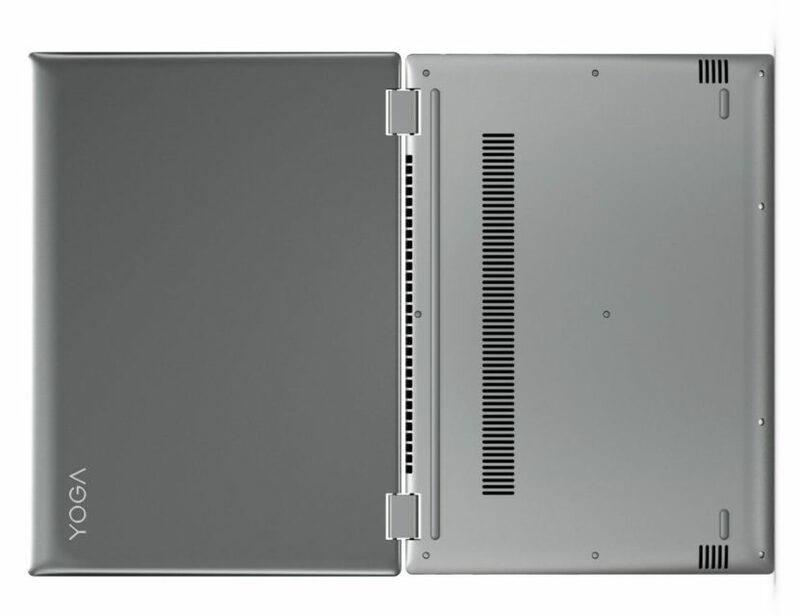 More compact and thinner than its predecessor (Yoga 510-14), the ultrabook sports this declination a darker silver shell at the lid. The design is no longer neutral in the absence of special finishes. Lovers of sobriety will find necessarily their account. Another difference, aluminum replaces the plastic on part of its shell for more robustness. It\’s unfortunate that the keyboard is still not backlit. Like any good self-respecting Yoga, the 520-14IKBR is equipped with rotating hinges that allow its screen to bend under the angles. With a simple gesture, you can go from a classic office use to a tablet (flip screen on the back of the keyboard) through the tent or easel mode. The autonomy should be around 7 hours in Internet browsing with active WiFi, it is satisfactory. Strong point on this declension, the privileged storage gives pride to reactivity. Indeed, a dedicated SSD of 256 GB is in the game, to bring its fluidity to Windows 10 and the overall execution of programs while not sacrificing too much capacity. If you count the place occupied by the system and programs, there is about 200 GB free, enough to house a small part of your toy library. For the rest, it will be necessary to opt for an external solution or online. The heart of the ultrabook follows in the same direction with the arrival of the Quad Core i5 Kaby Lake Refresh low consumption last generation supported by 8 GB of RAM . This duo is perfectly comfortable with office and multimedia tasks, including surfing the Internet, playing videos, working on Office or photo editing (Photoshop, Lightroom). It can also tackle other missions a little more demanding (Adobe Premiere) in reasonable proportions. In addition, multitasking enthusiasts will have all the ease needed to multiply tabs on the web and active applications. As for graphics performance, the Intel UHD 620 chip is the only one to handle this in the absence of a dedicated solution. Estimated at the height of a GeForce 920M, it can allow some casual players to launch some old and undemanding titles in Full HD with great fluidity. Central element in this type of convertible configuration, the screen is not very well endowed here. His claims are even rather basic with a slab of simple definition (1366 x 768 px) and type TN (without confirmation of Lenovo). As a result, the viewing angles are narrow limiting the readability of the screen when you are not facing the slab. Only more to notice, Lenovo has tried to limit the brilliant effect of the touch screen with an anti-glare coating . Be careful, this has nothing to do with rendering a matte slab. Finally the connector ensures a very correct level with its standard size interfaces, which is no longer a detail at a time when fine silhouettes very often involve the arrival of micro-HDMI or micro-SD. Here, an HDMI port and an SD card reader are present as well as two USB 3.0 ports and a USB Type-C port . On the other hand, the Ethernet port disappears in favor of last generation wireless modules (Wifi AC and Bluetooth 4.1). The Yoga 520-14IKBR also hosts a biometric reader (independent, bottom right of the keyboard) to secure access to your data and log in to your session with a touch of your finger.